Deep Dish Gluten Free Pizza Dough - Chicago-Style Pizza at home! 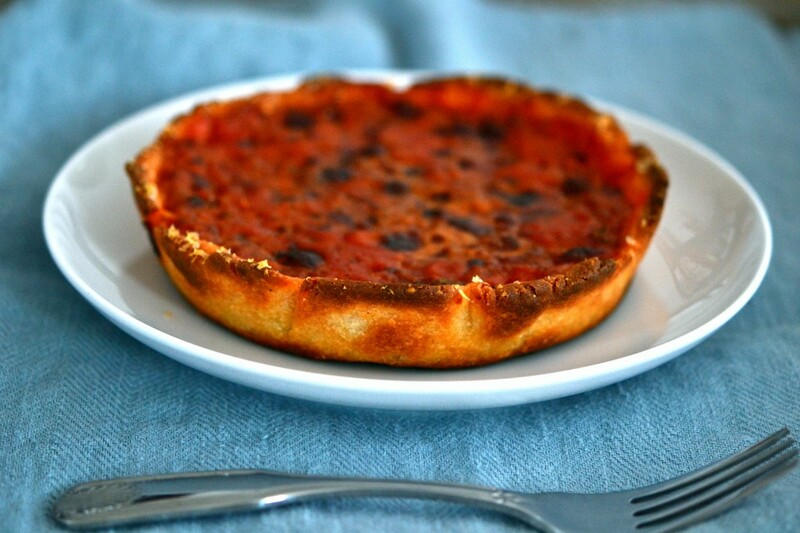 Deep dish gluten free pizza dough is so easy to make and tastes just like you remember. Load up your pizza with your favorite toppings! I’ve been making this deep dish gluten free pizza dough, in one form or another, since 2012. It’s the sort of pizza that you really sink your teeth into. Maybe it’s the bit of cornmeal in the crust. That crust has a lot of work to do in deep dish pizza! I love to bake these deep dish pizzas in 6-inch round baking pans, but of course it’s not necessary. You really just need something, well, deep. It is deep dish, after all. The recipe includes cornmeal as an ingredient because it helps make the crust a little more sturdy and gives it the bite you want. The cornmeal does make the crust delicate to work with, as opposed to your standard gluten free pizza crust, but it’s worth it! I’ve included two versions of the recipe for the gluten free pizza crust below, in case you don’t have the bread flour ingredients. If you use my no-bread-flour recipe below, you’ll find that it is more difficult to handle. The idea is to get the crust into the bottom of the pan however you can, as the pan will help it keep its shape during baking. You could probably even just press the crust into pan without rolling it out, but you’ll end up with thicker and thinner spots that will bake unevenly. Deep dish pizza is unique in more ways than one. Not only is it baked in a round pan, but most of the cheese is actually on the bottom of the pizza. Just line the crust with thick slices of a semi-hard cheese. I really like provolone here, but asiago and Gruyere are also really nice. You don’t want a cheese with a lot of moisture, though, as the tomato sauce will have more than enough. I always add cubed pancetta next, but you can leave it out entirely or add ground beef or pork for texture and flavor. Then, simply cover generously with tomato sauce and a layer of finely grated Parmigiano-Reggiano cheese. To make the dough using bread flour, place the flour, cornmeal, yeast, and sugar in the bowl of your stand mixer (or a large bowl if you have a hand mixer with dough hooks). Use a handheld whisk to combine well. Add the salt, and whisk to combine. Add the oil and water, and mix to combine. Using the dough hook attachment for your stand mixer or the dough hooks attached to your hand mixer, knead the dough until smooth (about 4 to 5 minutes). Transfer the dough to a lightly oiled bowl or proofing bucket large enough for the dough to rise, and cover with an oiled piece of plastic wrap or the oiled top of the bucket. Place the dough in the refrigerator for at least an hour and up to 3 days. To make the dough without bread flour, in a medium-size bowl or a stand mixer fitted with the paddle attachment, place the flour, xanthan gum, cornmeal, yeast and sugar, and whisk to combine. Add the salt, and whisk again to combine. To the flour mixture, add the oil and the water and mix to combine. Press the dough into a disk and place it in a greased bowl or bucket, and cover with oiled plastic wrap or the oiled top to the bucket. Place the dough in refrigerator for at least an hour and up to 3 days. To shape the pizza dough, preheat your oven to 375°F. Grease two 8-inch round baking dish with sides that are at least 1 1/2 inches high, or 4 6-inch round pans. Set the pans aside. Remove the dough from the refrigerator and place on a lightly floured surface. Sprinkle lightly with extra flour and knead by folding it over on itself until it is smoother. This will be much easier if you used the bread flour recipe. Divide the dough into two or four equal portions (depending upon the size of your pans), and roll each into a ball. Working with one portion at a time, roll out the dough into a round that is about 1/4-inch thick, flouring the dough and the surface and moving it around to prevent sticking. Lift the prepared round of dough carefully into one of the prepared baking dishes and press it into the bottom and up the sides of the pan, as you would with a pie crust. Repeat with the remaining piece(s) of dough. To assemble the pizzas, brush the bottom of each crust with the melted butter. Divide the sliced cheese evenly between the crusts, covering the bottom surface of each completely. Divide the cubed pancetta between the crusts next, followed by the oregano leaves and the tomato sauce. Sprinkle the tops evenly with the Parmigiano-Reggiano cheese. Cover each pan loosely with aluminum foil, and place in the center of the preheated oven. Bake for about 30 minutes, or until the sauce is bubbling and the pancetta is very fragrant. Uncover the pizzas and continue to bake until the crust is browned and some of the moisture has begun to evaporated from the tomato sauce (about another 15 minutes). Remove from the oven and allow to cool briefly before removing from the pan, slicing into wedges and serving warm. Original “without bread flour” recipe published on the blog in 2012. Bread flour recipe adapted from Deep-Dish Chicago-Style Pizza on page 193 of Gluten Free on a Shoestring Bakes Bread (Da Capo 2013). What a devine looking dish! I love deep dish pizza, but never tried to make it at home. Maybe it’s time! Thank you for 2 options of crust. Isolate upsets my stomach, so a version without it is great. I think I will try it today. I can’t eat corn – is there a way to replace the cornmeal, or omit it? haha. Last night said to dh, “can you go to gf on a shoestring and find a pizza dough recipe for me?” yay for me this was on the front page! He made it while I bought cheese. It was good even with ice cream salt (because it’s kosher, dh reasoned) and baked in a 9×13 dish. we’ll definitely make this again. But with normal salt so I don’t have to pick huge salt chunks out of the crust. Nik, Jordan is wondering about Churros. Any thoughts? Saw this recipe this afternoon when I was looking up your crisp recipe, just had to make it (and had all the ingredients on hand). It was a breeze and came out so tasty! Thanks so much. I love your site and recipes. I am wondering if you’ve ever made pizza on the grill. I’m having friends over tomorrow & kinda would like to try it.. I’m afraid it will fall apart and then, I will cry. One more thing, I couldn’t comment on the Cinnamon Toast Crunch so Im doing it here. It is so good! I’m trying to focus on cleaning (due to tom nights guests…) however I can’t stop munching on the cereal. It won’t fall apart. Just use a pizza stone, and go with high heat for a short time and then check frequently. Hi Nik, I LOVE that you are bringing out old recipes with pictures. Some of us weren’t gluten free last summer! I have the round USA cake pan (I know you are happy about that!) and I assume that would work. I am thinking that it would server a family of four? Where did you find your cute mini deep dishes? Bring on more from the archives! Revive those babies! They have felt neglected and unloved. Your USA Cake Pan will work great. It’s definitely enough for a family of 4. The deep dish pies are filling, especially if you put something else in there other than sauce and cheese. The mini deep dish pans were from Williams Sonoma. I tracked them down, and they’re no longer available according to the W-S website! Thanks Nikki. You mention a cast iron skillet. I might try that one time too. I heart deep dish. My favorite pie comes from Pizzeria Due (the brother of Uno, basically the same thing!). I like it with finely chopped broccoli, mushroom and sausage. It is unreal! Somewhere along the way I lost my deep dish pan. Thanks for posting this. I can’t wait to make it. Wow, didn’t know that about the pan never really getting clean. Gulp. Better get a new pan. I don’t think I cooked anything glutenous in there but I don’t want to find out the hard way. Good to know. And … good idea! Are you kidding?! Of course it does, Maryclaire. They ate it at the @drsteveshow! No way! Does it work? Now I can eat pizza without regret. You’re very welcome. It sounds like maybe you thought that many familiar foods were out of your reach, and now you’re discovering that you really can have whatever you like — except gluten itself. It can be kind of overwhelming – or at least others sometimes experience it that way. Or maybe you’re just really happy! Either way, it’s my pleasure to help. Do you think this recipe could be frozen to make a freezer meal at a later date? If so, at what point would be best to stop? Thanks! LOVE the blog and have your cookbook! I bought that first before realizing there was a blog! I’m THRILLED to see the yummy recipes keep on coming! Since this crust is a yeast dough, I would bake it before freezing it. I think it would freeze quite well, actually, after it is already made. Just bake it for the first 20 minutes, allow it to cool for about 10 minutes, then wrap it tightly and freeze it. When you are ready to use it, allow it to defrost in the refrigerator for a bit if possible, and then finish baking it – uncovered – for the final 10 minutes that it takes to brown the crust. If it is not yet defrosted, I would even defrost it a bit in the microwave before baking it in the oven. Just be careful not to microwave it so long or at such a high temperature that you cook it in there. Then crisp/brown it in the hot oven. I hope that’s helpful, and I hope you’ll keep visiting me here on the blog. If you ever have a question about anything related to the book, just comment on the most recent blog post (even if it’s not related). I’ll answer speedy quick. I can’t get Better Batter locally … any thoughts on another flour blend that would work well? I order Better Batter through their website. You can use any all-purpose gluten-free flour you like, except for the bean flours (like Bob’s Red Mill all-purpose gluten-free flour) because it doesn’t not work the same at ALL. King Arthur Multi-Purpose gluten free flour is good (but expensive), and I understand that Gluten-Free Pantry’s all purpose gluten-free flour is good, too. I hope that helps! I made it tonight too! Big hit with the family! Very yummy! :) Thanks!!! Will making the dough in my Kitchen Aid work? I don’t have a processor and I’m to lazy to mix it by hand. Yes, definitely you can use your Kitchen Aid. And I like your style. :) Let us know how it turns out! Don’t forget the spinach as an option in the deep-dish pizza! When I was first introduced to it in Chicago, our guide said, “People who hate spinach like spinach pizza, and people who like spinach LOVE spinach pizza.” I haven’t taken a poll, but I’m in the latter camp. I don’t think gf phylo dough is possible for spanikopita, but in lieu of gf phyllo dough, I’ll take gf deep-dish spinach pizza, please. I am protective of my time-commitment boundaries. I note the people who respect my limits, and the people who wheedle and beg. (I had to laugh when I found out my daughter related for show-and-tell the time that I closed the door on a couple of Comcast guys who were incredulous that I didn’t want to “save money.”) One way to stay centered is to choose my volunteer jobs before the jobs choose me. So what was your daughter showing and telling? You?! I made this tonight and it was DELICIOUS! Seriously- just as good as Uno’s. Thank you SO MUCH for posting it. :) Even my non-Celiac husband thought it was awesome. Aw, thanks. :) But you don’t need me to make this for you. Like you said, it’s easy to make yourself! Since going GF I’ve missed Deep Dish Pizza!!! Can’t wait to try this recipe! Just found the pan that I used years ago for deep dish pizza — can’t wait to try this one. (First I have to make more sauce. And then be home for dinner. Life is like that!) I’m sure this will be delicious! Thanks! I love it when you can go ‘back to the future’ like that, and reclaim your pan — and your food! I would love to know how it turns out. How long has it been since you have had good pizza? I LOVED those books! I want to be more like Pooh. And, your recipe looks delightful! Thank you! I’m so excited that you know the books! Benjamin Hoff is so smart. I wish I could be as smart as he is. And as taoist as Pooh. :) I have always always always loved the Pooh characters, and these books helped me understand why they always seemed so meditative to me. I hope you enjoy the recipe! Thanks for posting …. thank you so much for this recipe….I know what I’m making for dinner tonight. Can’t wait. I pushed the “stumbleupon” button and left a review…hope it helps!! Amazing…beautiful…and going on the dinner list for this weekend :) *muah* love you and your blog!! This is seriously so freaking tasty. I am really all hopped up on this one. I can’t stop thinking about this deep dish pizza, and really want to make one that is all mine and keep it a secret from the children. Don’t tell.